Please note that this product has been replaced by SILConverters 4.0 and you are strongly encouraged to use that product. This page is retained for those who, for whatever reasons, are unable to use the new version and require an older, unsupported, version. This package provides tools through which you can change the encoding, font, and/or script of text in Microsoft Word and other Office documents, XML documents, and SFM text and lexicon documents. It also installs a system-wide repository to manage your encoding converters and transliterators (TECkit, CC, ICU, Perl, or Python based, as well as support for adding custom transduction engines). For developers, it provides a simple COM interface to select and use a converter from the repository. It is easy to use from VBA, C++, C#, Perl, Python or any .NET/COM enabled language. This package is fully integrated with SIL FieldWorks, Speech Analyzer and Phonology Assistant software. It provides the same system-wide registry of installed and available encoding converters for all of these user programs. Additionally the package includes some extra utilities such as a clipboard converter for manipulating text between cut and paste operations. The previous support for EncConverters within AdaptIt has not been completed yet for v3.0. It is currently only available in the Windows version of AdaptIt with SILConverters v2.6.1. SILConverters 3.0 corresponds to the same version of the core EncConverters assembly as Fieldworks 5.4 and overcomes the uninstallation problem previously encountered in Speech Analyzer 3.0.1 and Phonology Assistant 3.0. If you uninstalled any of the applications which used the earlier version of the EncConverters core, it would become unavailable to the other applications that used the same, earlier version of the EncConverters core until an installation Repair was done. See this webpage for details. This new version solves that uninstallation problem. 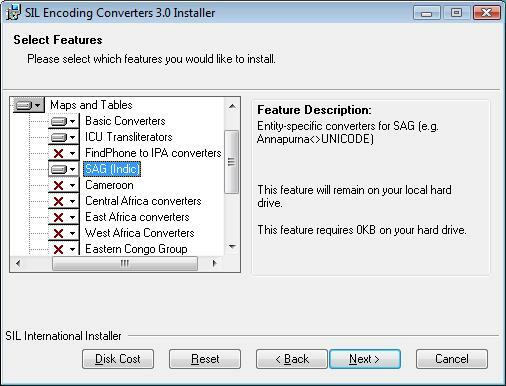 SIL Encoding Converters 3.0 Setup—Conversion applications are installed and conversion Maps and Tables are copied to your hard drive. Full installation instructions can be found here: SIL Converters 3.0 Installation. This document is intended to guide you through the Master Installer installation screens and initial SIL Converters 3.0 Setup. This guide may be sufficient for many users. However, to make full use of SIL Converters, you should download and refer to the Help for SIL Converters documentation (download below). This document gives installation help. This is the same information that is found here: SIL Converters 3.0 Installation. This version of SILConverters uses the same version of the EncConverters core as FieldWorks 5.4. MD5 hash: 5dc75df36170dbe7c82abe397dbc1219 This contains the same files as the above SIL Converters 3.0 package only (no addons) for offline installation (EXE file). It is provided for those who cannot download an EXE. MD5 hash: 15b75855582d7accdf5db2819be62979 This contains the same files as the above SIL Converters 3.0 Standalone installer (includes addons like .NET) for offline installation (EXE file). It is provided for those who cannot download an EXE. This section describes the encodings, font names, and converters contained in the different Maps and Tables packages available in the SILConverters 3.0 installer. You can check below for the fonts/encodings that you are interested in to see which Maps and Tables package to install. During installation, all the converter maps/tables in the selected package(s) will be installed into a fixed location on your computer (i.e. 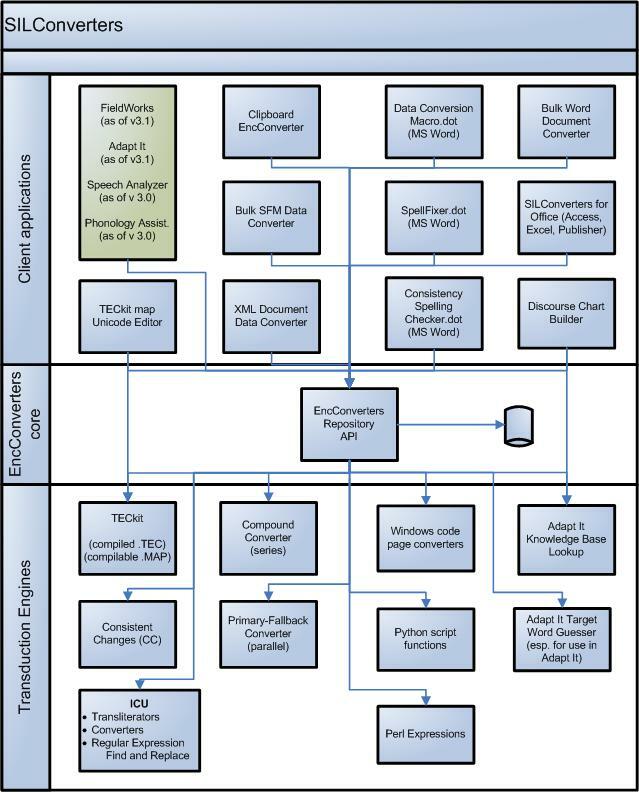 C:Documents and SettingsAll UsersApplication DataSILSILConverters30MapsTables on Windows XP or C:ProgramDataSILSILConverters30MapsTables on Vista).